As usual I lost interest in plants over winter and had even less interest in computers. Come spring my interest re-emerges as the plants start to wake up. So for the last few weeks I have been busy out in the garden and thought it was time to start posting again. In to something that resembles a garden. More on that next time. 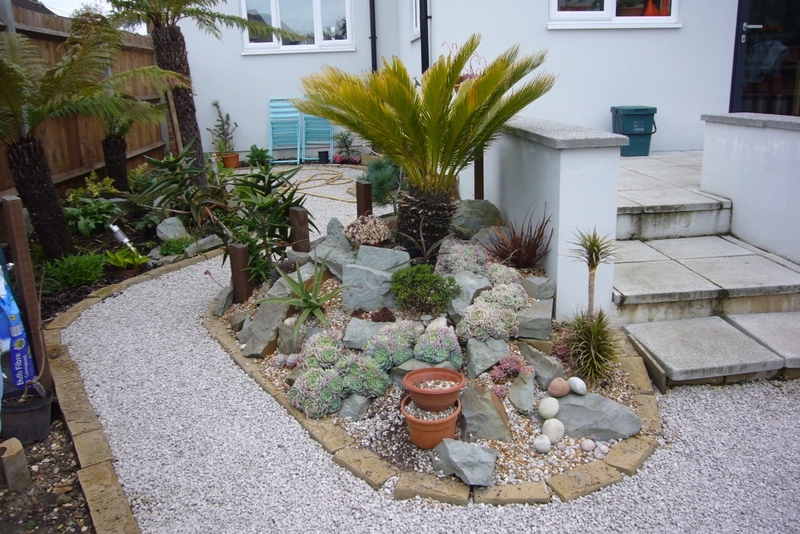 I figured for my first post of the year I should focus on how the succulent rockeries are doing. We had the mildest and wettest winter on record. 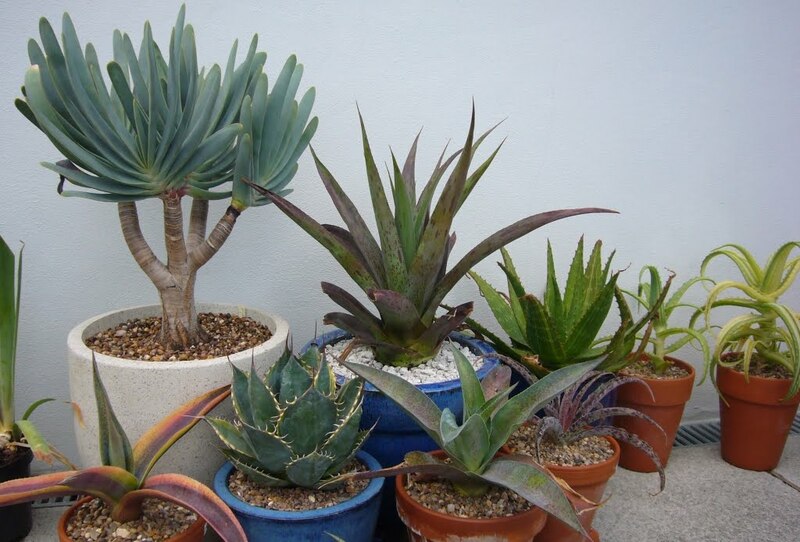 Given last years problem with the fungus attacking the agaves and yuccas, I was concerned this would not be good. 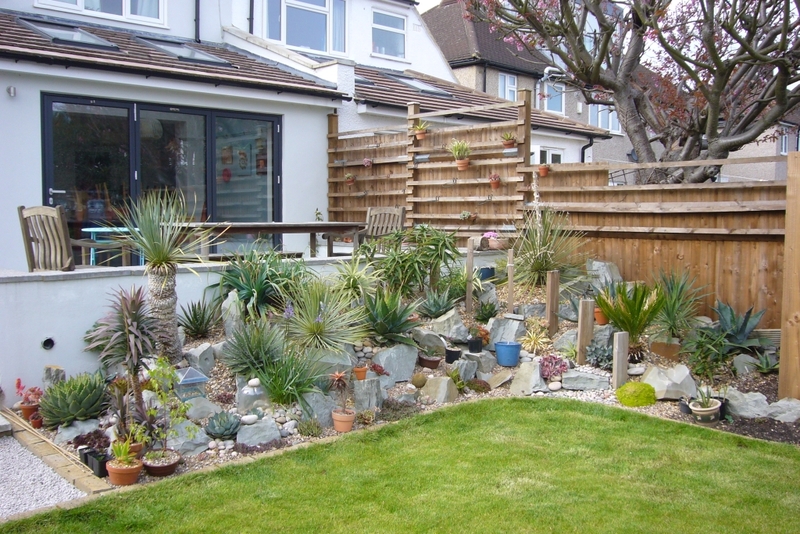 In fact with two very minor exceptions the plants show no sign of fungus damage. You can imagine how relieved I am. 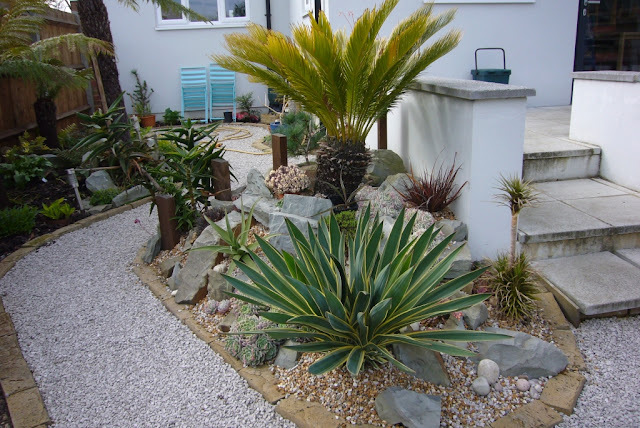 The cycad rockery looked as good as well. Everything has really grown over the last year and this has caused a few problem areas. The first can be seen in the photo above. That yucca was tiny when planted and while I know it would grow, I didn't expect it to grow so quickly. Here it was this time last year. So they have now outgrown the space and it wont be long until they cause even more problems. 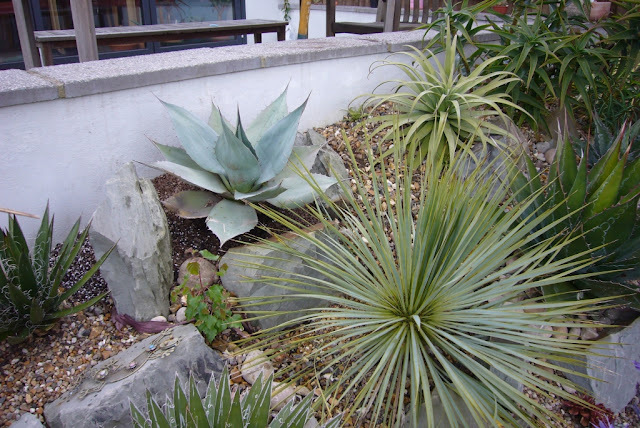 It seemed sensible remove them now, especially as I wanted a yucca or two for the front garden. So out they came. 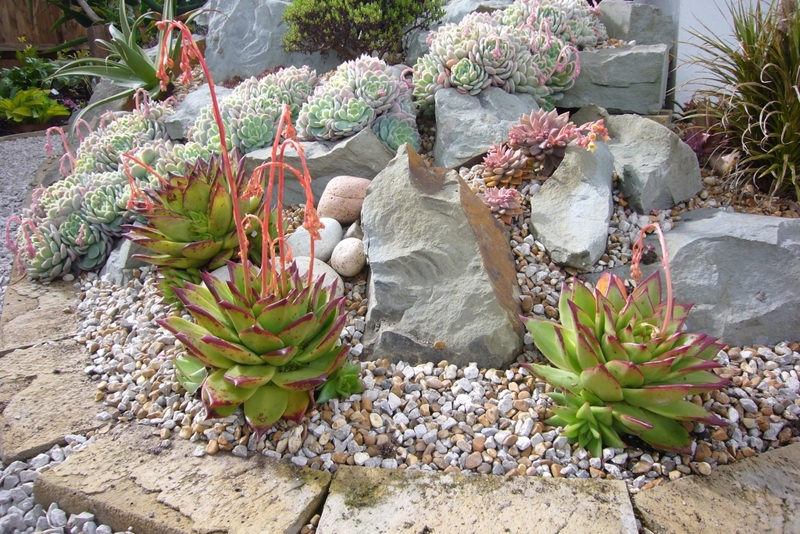 Look at how much the echeveria elegans have grown. To think they were single plants when planted, should be a great sight when they all flower. So what to plant to fill that space. 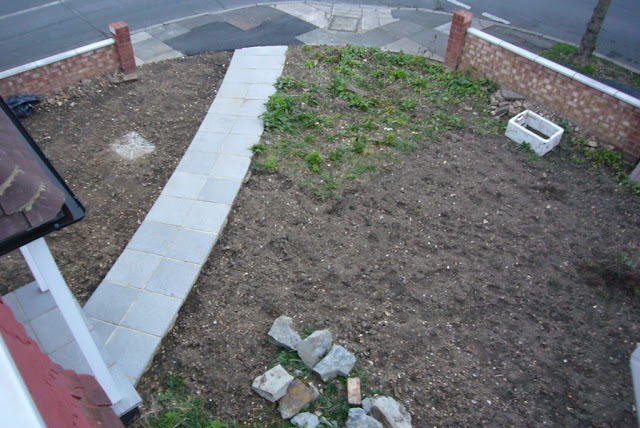 Something with structure but nothing that is going to grow and obscure the rest of the plants or grow out into the path again. Step up problem area number 2. The aloe polyphylla is looking amazing, not only has started to properly spiral, but it has grown big. I guess last years feeding program really did work. Despite not being protected there is not a single bit of damage. 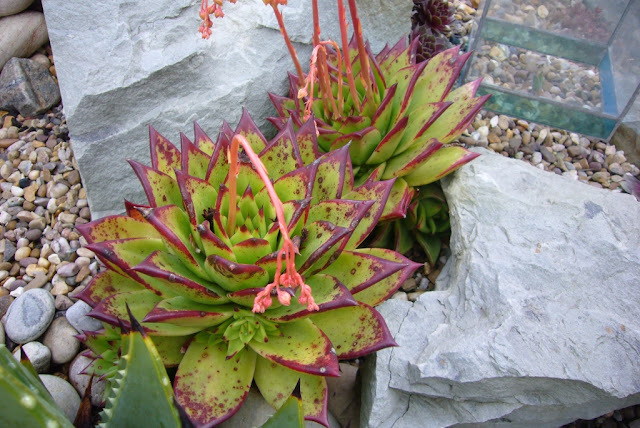 The problem is that it's now starting to impinge on the echeveria agavoides red edge. These have also grown and really no longer fit the space. They look great between the stones and I was torn about moving them, but the new pups are forming under the rocks and it is only going to get more cramped. Plus taking them out at this time of year will mean they have the whole summer to get settled and it will be better longer term. 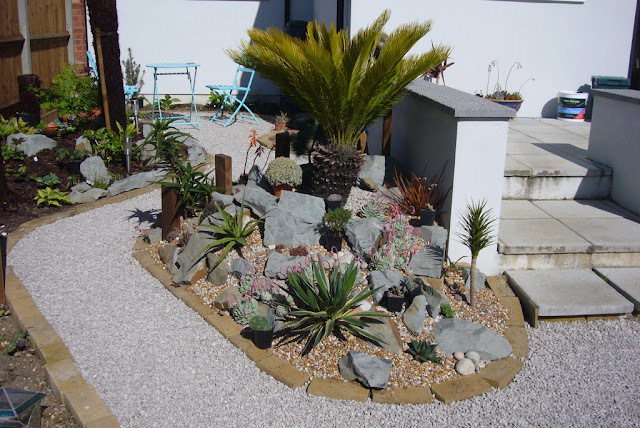 So out they came, and a short move over to the cycad rockery. For a while I thought they looked too small and would get lost, but they can now be seen and have space to grow even more. It has really grown on me in the days since planting it up. So two problems down, a few more to go. Next up the clash between the new smaller yucca rostrata and the kniphofia. This was easy, the kniphofia caulescens was pulled out and again conveniently fitted perfectly into the front garden. There just happened to be the perfect plant sitting waiting to be planted, ironically it was going in the front but really deserved to go somewhere it could be enjoyed. 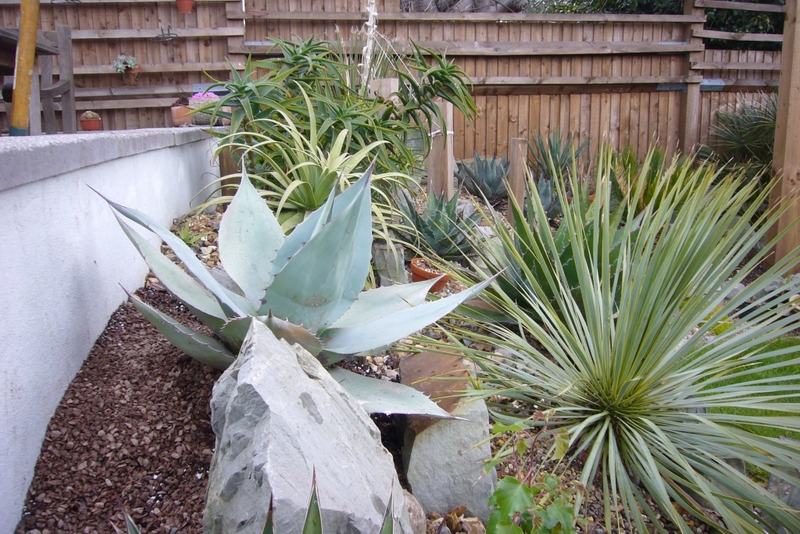 It is a large (by UK standards) agave ovatifolia. No doubt it will grow, and given we sit on that wall may have to be corked when we have friends around. But it looks perfect there. Given it is only the start of May I am pleased how good everything is looking. 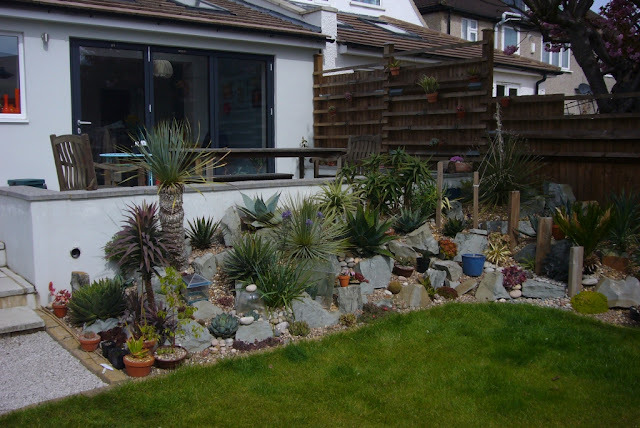 I still can't get over the aloe polyphylla, how did it get that big without me noticing. There are still a few areas to sort. 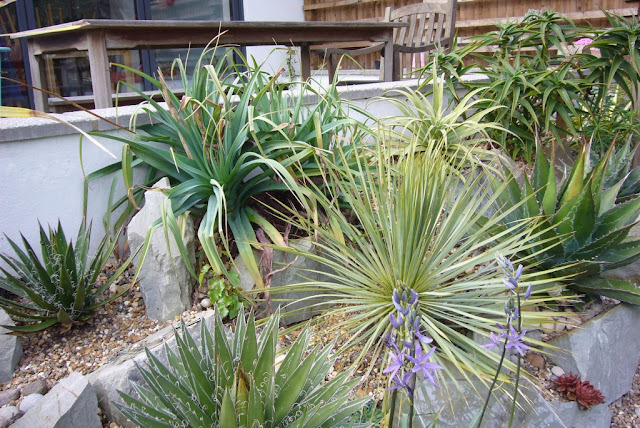 I need to remove the camassia leichtlinii, it is too messy and doesn't work in front of the agave filifera. Finally we are considering painting the wall a different colour. Having see a friends garden where they have purple wall, I am tempted by that. The plants will show up better and it will bring a splash of colour into the garden. That last one still needs to be signed off but hopefully I will get permission. Either way the garden should take big leaps forward this year. Wow, impressive! Are they all planted straight into the gravel, or is it a top mulch with subsoil below? 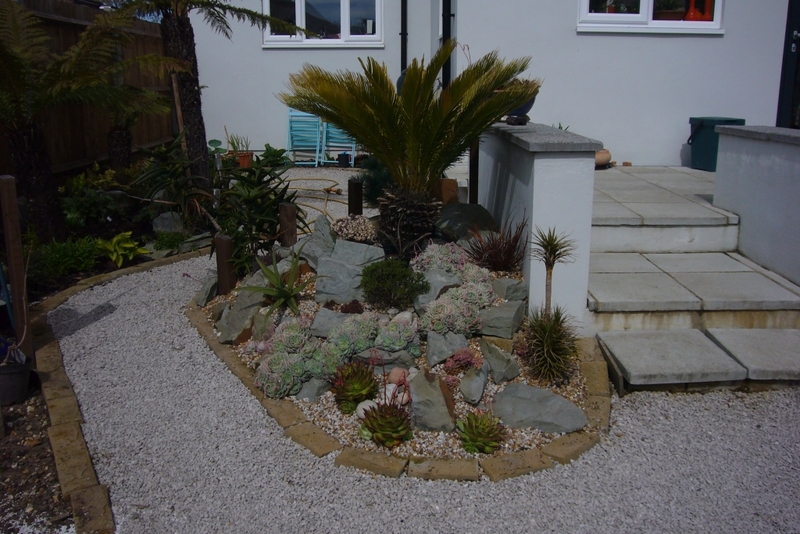 We used the rubble from the building works to rise the rockeries up above soil level and to create planting pockets. These are filled with soil and gravel mix. It is very free draining and in sun pretty much all day, so is lovely and warm. Spikey! Long time no blog! 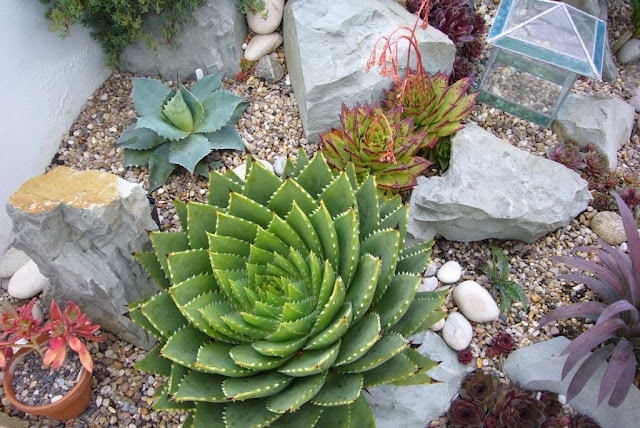 Your Aloe polyphylla looks stupendous, one of the best I've ever seen. Great work--you've spent your time wisely. Thank you, it really seems to have settled in. The problem now is that it looks so good I am going to worry about it being damaged next winter, while I was happy to leave it before.